If you liked ESPN's 30 for 30: The U and Pony Excess, this featured ESPN documentary is not one you'll want to miss. 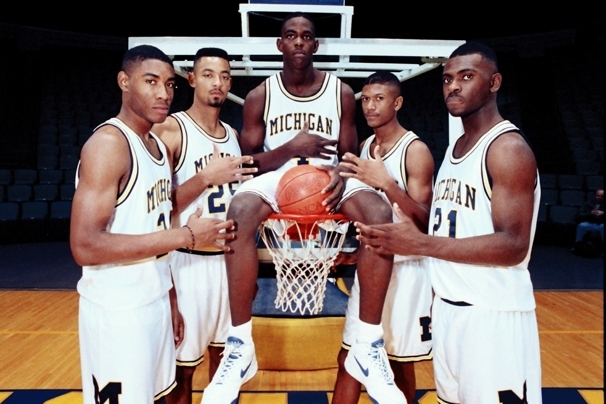 Detailing the historied presence of an incredible group of players on the University of Michigan's basketball team, The Fab Five tells a two-hour story of the five freshman who started it all: Juwan Howard, Ray Jackson, Jimmy King, Jalen Rose, and Chris Webber. 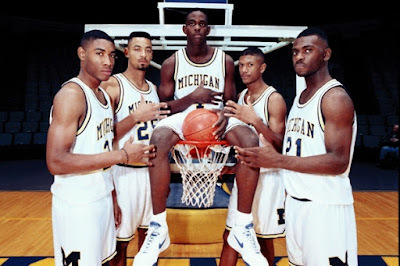 There is little doubt in anyone's mind that these five made up, to this day, the greatest class ever recruited. Their baggy shorts, black socks, and rap music got them notoriety off the court, but it was their unbelievable talent and the way the five of them played off each other that lead them to the championship game two years in a row. Even after all of these years, seeing them lose the way they did (to Duke and UNC nonetheless) was still incredibly painful. My heart broke for Chris Webber as he realized that his timeout had cost them the chance to bring the game into overtime once again. It didn't surprise me that Webber didn't appear in the film, and it warmed my heart a bit that the other four guys were either holding a grudge, or if nothing else, disappointed in how Chris handled his situation with Ed Martin. Would I have liked Chris to explain himself, or at the very least apologize? Sure. But there is a time and place for that, and hopefully it's in 2013 when NCAA sanctions on university contact with Webber expire. Despite all of this, Michigan is the most resilient school I know. We fell from the top as a legendary and elite football program and are slowly climbing our way back to the top. Don't think we aren't capable of doing it again.